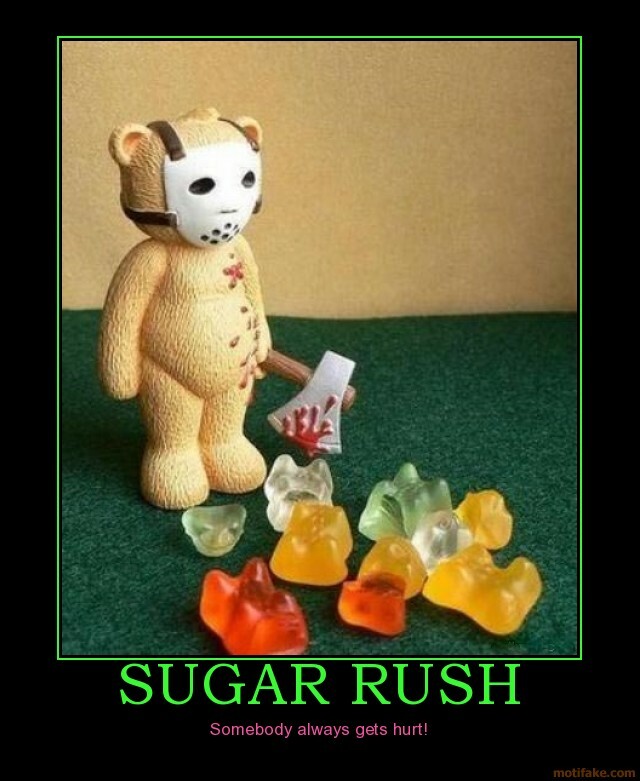 Sugar has always been my Kryptonite. Sugar is my #1 Struggle. You would think that losing 110+ pounds would mean I’d won “the battle” with fat. Nope. I still struggle with sugar every single day. It’s my go-to comfort food. If I’m sad: chocolate. If I’m sick: ice cream. If I feel happy: cheesecake! Recently I went to my doctor for something and as a side note I asked her about my insatiable hunger. I explained that I am eating enough calories, that the food I eat is healthy, and the Nutritionist I saw said everything was A-Okay. So why the hunger? She took one look at my food diary and said I was eating too much sugar. She said that eating refined sugar (i.e. not sugar from things like fruit but from candy) causes a spike in blood sugar and then a crash which causes hunger. What?! I started to do some research. 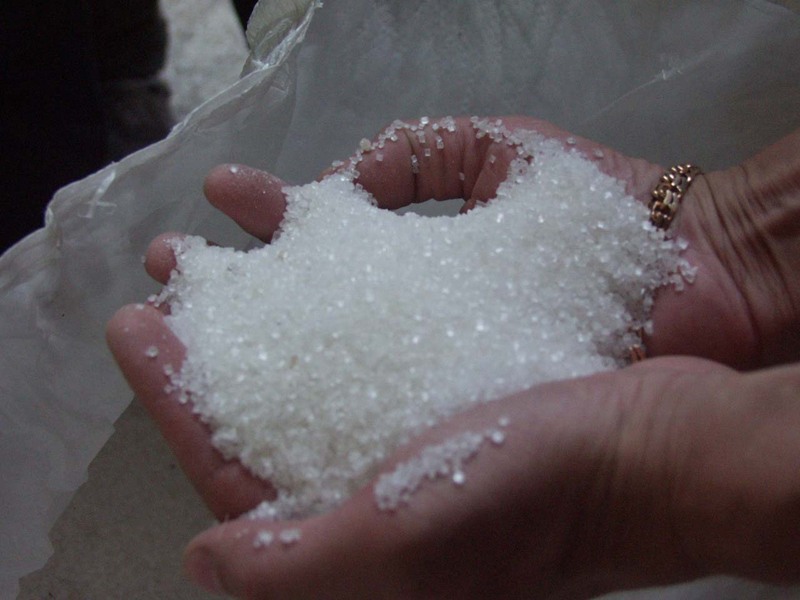 Then I stumbled onto this article: Beat the Sugar Habit. 1. Stop drinking Soda. Diet is just as bad for you! I thought for a long time that I was okay because I was drinking diet soda. Nope. My body told me it didn’t like the artificial sweeteners, too. I switched to Sparkling water. And I buy unsweetened tea. I’ve grown to love unsweetened tea, too. At first it was a bit bitter, now I love it. And tea is full of good antioxidants! 2. Switch to Greek Yogurt. I stopped buying the traditional yogurts because they have sooo much sugar in them! Now I eat only Greek Yogurt and I prefer the vanilla or plain. Instead of getting the fruit in the Greek yogurt (it’s just a bunch of syrup) I add my own fruit. 3. Add fresh fruit to things like ice cream or yogurt if you want a treat. Real fruit causes a slower rise in blood sugar than sucrose or HFCS. 4. Beware of condiments! Ketchup is loaded with sugar (probably why I love it). Try using mustard and light mayo instead of ketchup. 5. Skip the Candy. It’s hard, I know. Especially if you work in a place where it’s readily available. Try to distract yourself from the Temptations. Chew sugar-free gum. Brush your teeth. Drink a lot of water. Anything to NOT eat the candy. 6. Don’t deny yourself of everything. Having a little bit once in awhile keeps you from going nuts. 8. Eat more Fiber. It’s more filling and gives us energy a lot like the quickie energy boost sugar does (minus the crash). It was at PGE Park and the ad is by the Dairy Farmers of Oregon. I took a picture of it because it was so strange. Why would the Dairy Farmers of Oregon want to push EXTRA sugar onto kids? I’m assuming this ad is suppose to appeal to children. 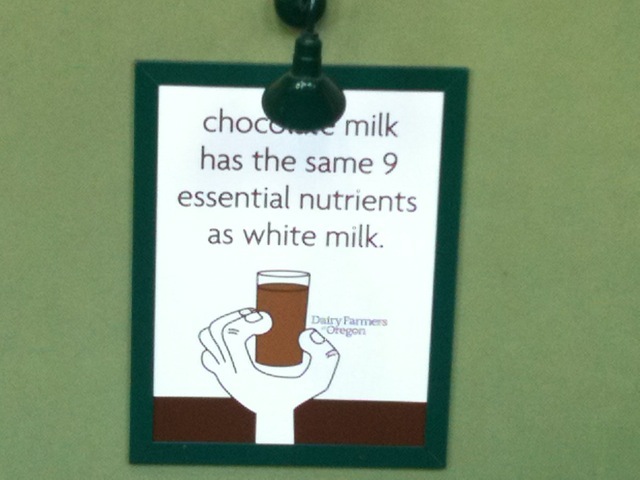 The statement is true; but they leave out the part about how the chocolate milk has about 100+ extra calories in it. I drink chocolate milk after long runs only. The poster struck me as strange and just another example of how much extra sugar is added to everything. QUESTION: How do you try to limit your sugar intake? 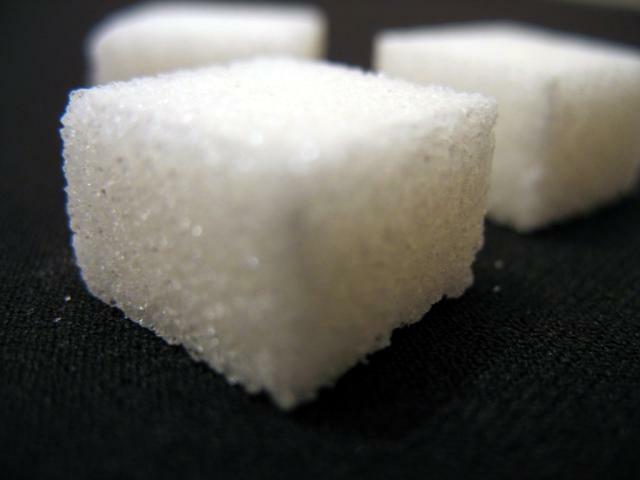 wow – they are some seriously scary sugar stats!!! I rarely eat candy or desserts, and I don’t drink ANY soda (unsweetened tea and water FTW), but my downfall is orange juice. I love it. If its in the refrigerator, I drink a lot. If its not there, I go out and buy some. Its a bad habit and I want to kick it! Any suggestions? Hmm that’s a tough one. What about buying those single serving orange juice containers and limiting yourself to one a day? Have you tried Trop 50? I think its delicious and it’s half the calories and sugar of regular OJ. Or, you can always do half water half juice or just a splash in your water for flavor like I like to do. Awesome awesome awesome post! On my plan, I try to limit my sugar to under 15 grams/day which is no easy feat. It takes some major label reading. I don’t recommend it to everyone but it totally helps with cravings, it helps me lose weight, AND it battles my reactive hypoglycemia. 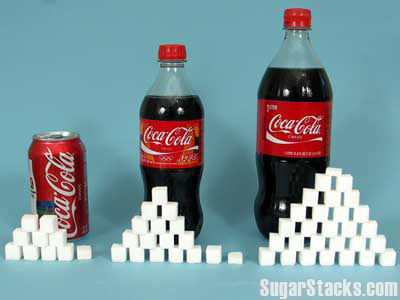 I really do think that sugar is worse for you than (most) fats. I’m just like you — I really try to limit my sugar by reading labels and cutting our refined carbs like cereal and granola. Even Kashi is not that good for you! I’ve been sugar-free for about a year now, and have gone up to 2 years before falling off the wagon. Sugar just makes me feel bad, period. If I have sugar, I feel like I’m going into a coma afterwards. I get lethargic and can’t keep my eyes open. If I have ANY sugar, it’s in low glycemic fruits like berries. Sugar substitutes such as Splenda and Truvia help when there is a major craving, but I’ve noticed that I make things less sweeter with those even. For example, the Crystal Light packets for bottled watter- I use 1 packet in 1 liter of water, which makes it double diluted. Any less diluted and I feel like I’m drinking syrup. Blech! The longer I go without sugar, the less I want it. Just isn’t worth it for the physical side effects I get with it. I haven’t tried Truvia yet! Do you like it? Yeah, Truvia is great- well, any stevia product really- I have individual “splenda-size” packets I use occasionally to sweeten a smoothie. If I’m “baking” a treat though, I usually use Splenda because it’s much easier to measure out in it’s Granular form. The stevia has a little bit more of an aftertaste. I wanted to try using Splenda with baking but is it the same amounts as what the recipe calls for regular sugar? I haven’t missed it either! Once in awhile I’ll splurge and have a diet coke though. Good for you calling them out on the chocolate milk poster! Sugar! I have a hard time with it sometimes. If you start eating it, you can really get on a roll. But, I do allow myself a small sugarfilled treat a day and I find that helps! You make an excellent point. If I STOP eating sugar, I can resist it. But one bite and I’m back on the addiction-wagon again.